Leprocaulon microscopicum (Vill.) Gams ex D. Hawksw. Thallus: producing a weakly developed turf or a sorediate crust; primary thallus persistent, granulose-sorediate central axis: with hyphae parallel, conglutinated, 2.5-3.0 micrometer diam., outer wall thinner than lumina surface: yellowish-white to often pale greenish or occasionally slightly bluish; subtly arachnoid-tomentose, towards the base glabrous and darkened (brown-blackish or aeruginose-bluish), in herbarium usually developing very fine, azure-blue to whitish, downy mold-like covering (composed of crystals of unknown composition) outer mantle: with hyphae slightly wider than those of axial strand, loosely interwoven pseudopodetia: usually at least partly well developed, crowded, ± erect, 2-4 (-6) mm high, 0.1-0.2 mm thick, slender, filiform, usually simple in the lower portion, in the upper portion sparingly branched phyllocladial granules: ± completely covering the surface, mealy-powdery, sorediate, disintegrating and turning green, 35-100 micrometer in diam. ; hyphae: slightly over 0.3 micrometer in diam., loosely interwoven Spot tests: thallus K- or indistinct yellowish, C-, KC+ yellow, P- or indistinct yellowish, UV- Secondary metabolites: usnic acid and zeorin; rangiformic acid, unidentified fatty acid, and three unidentified substances (all accessory). Substrate and ecology: on thin soil, detritus, or moss, especially in shaded areas or in crevices associated with ± dry sides of cliff faces and walls, most frequent in coastal sites World distribution: western North America, Europe, Asia Minor, N. Africa, Macaronesia, Australia Sonoran distribution: rare in Arizona at c. 2000 m; common in southern California, Baja California and Baja California Sur, at 15-360 m. Notes: The mold-like covering, similar to that found in various other lichens containing terpenoids along with usnic acid [e.g., many Vermilacinia spp. ], is a very distinctive feature of this species, and starts becoming evident (at least under a dissecting microscope) within 5 years or less in the herbarium (much less than the 50 years or more suggested by Lamb and Ward 1974); it should not be confused with occasional true fungal molds (which sometimes occur on specimens of other species, but can usually be distinguished by the presence of tiny globular conidiophores). 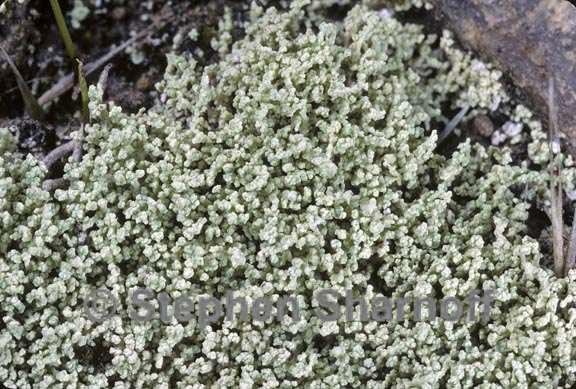 The color of the thallus in L. microscopicum is rather variable, in our area often more greenish or bluish then yellowish, but is rarely as distinctly whitish or bluish as in L. albicans and L. gracilescens, and (in contrast to some material from other parts of the world) Sonoran specimens consistently contain usnic acid as shown by TLC. The only specimens reported from the Sonoran Region (southern California) by Lamb and Ward (1974) were of Deficient phase IV (containing only usnic acid and zeorin), but we have found occasional specimens from the southern California coast containing atranorin (one also with rangiformic acid and an unknown substance) or various unidentified terpenoids or fatty acids.